Want to make your videos into DVDs to watch on your TV from your Mac? Don't be stuck in front of your computer when it's TV time. Converting MPEG video to DVD on a Mac is an easy way to make your videos portable. The MPEG, Moving Picture Experts Group, format is common for video and digital cameras, but cannot be burned directly to DVD. Make sure your Mac can burn DVDs. Many Macs are already equipped with a SuperDrive that can burn DVDs. If your Mac doesn't have a SuperDrive, you'll need an external DVD burner. If you're not sure whether your Mac has a SuperDrive, select "About this Mac" from the Apple Menu at the top left corner of your screen, then click "More Info." 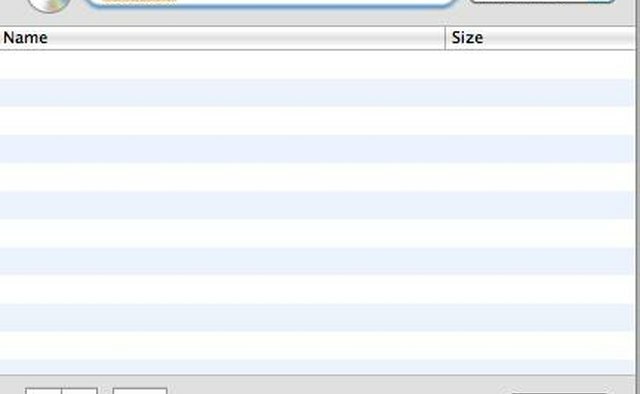 This will open up the "System Profiler" application. 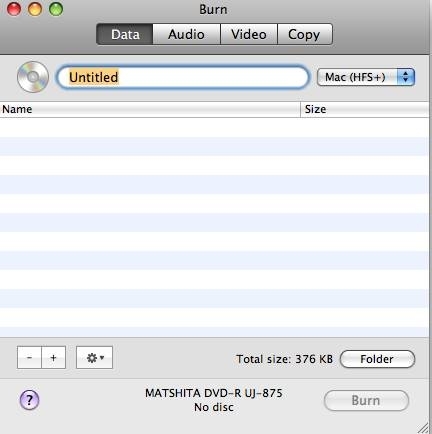 Click on "Disc Burning" and ensure your Mac can write DVDs by looking at the line "DVD-Write." If you can burn DVDs, several formats will be listed. Confirm the blank DVDs you own are compatible with one of these forms (-R, -RW, etc.). Download "Burn" to your computer system. Burn is a software conversion program for media. Open the folder you've just downloaded (called Burn) and double-click the application "Burn" to launch it. When launched, Burn opens a window that looks like the image below. Choose "Video" from the boxes at the top of the menu. Ensure "DVD-video" is selected in the drop-down box to the right. If you want, you can name your disc ("Wedding DVD," for example). Now we're ready to start adding videos, which we'll do in the next step. Select the files or clips you want to convert to DVD-playable format by adding them with the plus ("+") button, then finding them on your hard drive. Once you add video files, Burn will convert them to DVD format--choose NTSC or PAL depending on your DVD player's region. Now that your videos are converted, you're ready to burn them! Click the "Burn" button and follow the final step below. Insert a blank DVD into your drive. Once Burn recognizes that you've done this, you're able to finalize the process by pressing the "Burn" button again. After the burning process is complete, you're ready to watch it on your home DVD player or send it to friends! Videos edited using iMovie have to be exported in order to use them in other programs, so you may have to find your project in iMovie and select "Export" from the "Share" menu. Choose a format and location for the exported files, then add them into Burn. DVD players in the Americas, Japan, Korea and elsewhere utilize the NTSC format, while PAL is prevalent in Europe and Africa. Make sure you choose the right format for your DVD player. Convert the MPEG clips you want to burn to DVD. Many applications are able to do this, and you may already have iDVD installed on your computer. However, for speed's sake, the free software Burn is recommended. Other commercial programs like Toast can convert these files as well. Decide what software you will use and launch that application. These instructions are not intended to condone piracy. You must own the rights to any and all clips before creating your DVD.